[Download] 1-Page Client Attraction Mind Map - Coach & Grow R.I.C.H. Have you seen this super helpful PDF Mind Map that outlines how to attract and enroll clients through a simple 5-stage system? 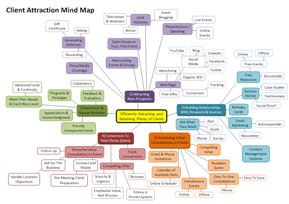 Download the Client Attraction Mind Map here. It’s from my good friend Ryan Eliason, one of the world’s top coaches for socially conscious business owners. He’s taught this 5-stage system to over 4,000 clients from 85 different countries – WOW! I love how this Mind Map clearly illustrates how to efficiently attract and retain clients in a way that will feel good to you and your new clients. Get the Mind Map & training series here before it goes away.